Halloween is right around the corner and I love to play dress up! This year it's my husbands turn to pick our costumes and he has a really cool costume idea in mind so watch out for a picture this weekend on my Instagram. Are you guys into Halloween and dress up? For me, Halloween is always fun and I think I'll keep dressing up even after I have kids. It's not about Halloween parties for me it's more for dressing up, getting creative with makeup and plus candy duhhh! 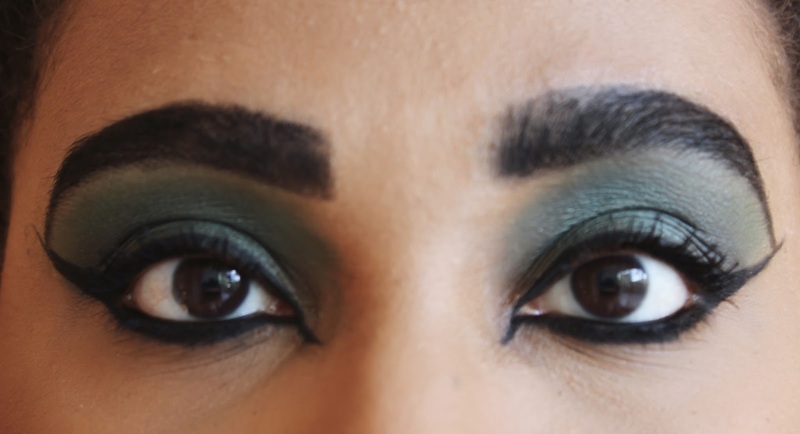 Today I wanted to share a quick and easy tutorial for a Cleopatra makeup look I created. If you're like me and don't like to spend too much money on a costume this is an easy look to create at home with simple makeup products and simple things from your wardrobe. I've always loved Egyptian costumes, history and looks so this was one of my favorite costumes to recreate. -First I primed my face with the Buxom Divine Goddess Luminzer to give my face an extra glow. 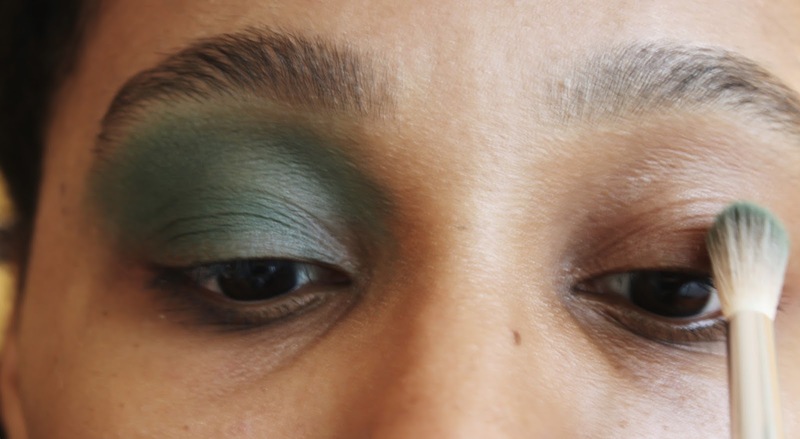 - Used the emerald green color from this E.L.F palette I purchased from Target a while ago. It has a good mix of colors. 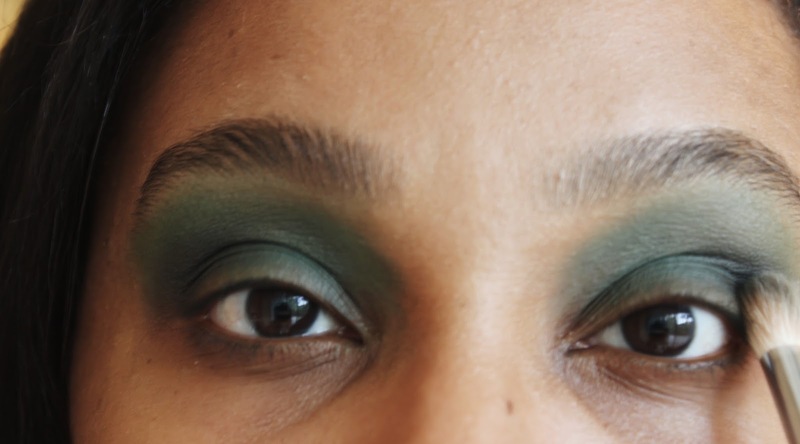 I swiped that color all over my lids with a fluffy brush. I went all the way up to my brow bone. - From that same palette, I used a dark blue for the outer part of my eye to create more depth and create a little smokey effect. -Next, I dabbed all over my eyes the NYX eyeshadow in "jaded". It's a very similar green to the one I started with from the E.L.F palette but this one has a bit of a shimmer to it. So just to add a little shimmer I dabbed it right over everything. -Now the most important part of the eyes! I used a black eyeliner from Buxom to outline my eyes. First I drew a line coming out of the corner of my eye then worked my way back drawing a line underneath. At the edge, I extended the cat eye more than I normally would all the way to the end of my eyebrow. -Repeat the same steps for the top portion. - Now it's time to fill in the waterline. I used Maybelline's Master Kajal black liner. Fill it in until you see no flesh. -Then fill in eyebrows with a black liner. I used a black one from Pop Cosmetics. I also extended the wing line just a little bit past the eyebrows. -Now I added my foundation, Maybelline's Matte + Poreless Fit Me and concealer from Wet n' Wild. - For bronzer, I used Buxom "Maldives". This bronzer is glowy which is perfect for this look. - Mascara I used Buxom's Big Tease. - For highlighter, I used OFRA's "Everglow". I wanted my Cleopatra to be super glowy. If you are a highlighter junkie like me I highly recommend this highlighter. - Now my favorite part, lipstick! I originally thought of doing a shimmery gold lip but went with bright red. The possibilities are endless for this costume look. I lined my lips with Buxom's Plumpline Lip Liner in "Code Red" and finished it up with Buxom's matte lipstick in "Red Inferno". Makeup done! Now add your accessories. For hair since my hair is already in a bob, I didn't have to buy a wig. I did add my faux bangs I've had lying around from last year. For accessories, I added this headpiece from Forever21 and an exaggerated necklace over a high neck top with a big gold bangle. I hope you guys enjoyed this tutorial! I linked every product for you guys. Comment below if you are dressing up for Halloween this year? Me encantó el maquillaje, creo que ya sé a quien llamaré para que me maquille este Halloween. I am trying to do Elizabeth Taylor as Cleopatra eye makeup (as suggested here https://goo.gl/9neazp), and for same do I have to use bright blue eyeshadow and subtle tortoise under the brow by extending it every time? As suggest by known makeup blogs like TotalBeauty and others, Royal Blue and gold are two most important color when going or Egyptian Eye Makeup, which again is much praised in many makeup forums by community like this https://goo.gl/9neazp. However, do to darker shade of my Skin, it looks bad. Any other lookalike color I can try?